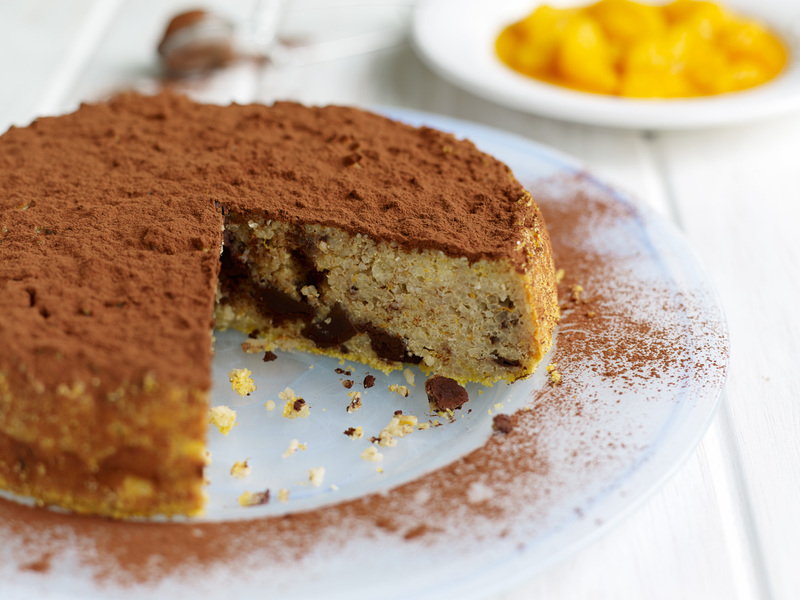 A traditional, naturally gluten-free Italian dessert, torta di riso is a chilled baked rice pudding cake. In this delicious recipe basmati is flavoured with the classic combination of orange and dark chocolate. Prepare a 23cm springform tin by brushing the inside well with melted butter. Sprinkle in the polenta and tap around the tin until its evenly covered. Set aside. Add the milk, sugar and orange zest to generous saucepan and bring up to the boil, stirring well until the sugar has dissolved. Stir through the rice and simmer steadily, stirring regularly, until the rice is cooked though and the sauce thick and creamy. Turn off the heat and allow to cool completely - spreading out onto a shallow tray will speed this up considerably. Whilst the pudding is cooling, make the caramelised oranges by adding the sugar to a small heavy based saucepan. Set over a medium heat and leave, without stirring, until the sugar begins to melt and turn to caramel. Continuing cooking, tipping the pan back and forth to ensure all the sugar melts, until you have a deep amber syrup. Very carefully, it will spit and hiss, slowly pour in the hot water, swirling the pan gently to mix. Once all the water is in, drop in the orange segments, turing them over to coat in the syrup. Pour into a shallow bowl and set aside to cool. Preheat the oven to 200ºC / fan 180ºC. Once the rice pudding is cool, stir the egg yolks through the rice. In a clean bowl, whisk the egg whites until they form stiff peaks. Fold the egg white through the rice with a large metal spoon until it is just mixed. Finally fold through the chopped chocolate before pouring into the prepared tin, leveling with the flat of a knife. Bake in the oven for 30-35 minutes until golden brown in top and just set. Allow to cool a little in the tin before removing to a serving plate.